First, say it with me: Awwwww! 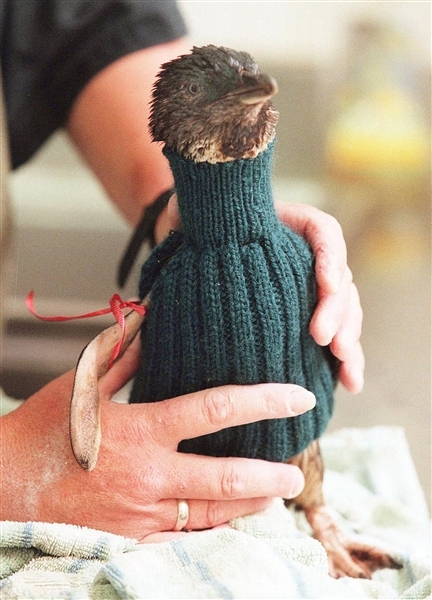 Yes, penguins in sweaters are too adorable for words. But there's a very good reason they're rocking those rib knits. New Zealand suffered an oil spill on Oct. 5, and more than 1,000 sea birds have already died as a result of the 350 tons of oil that spilled from a cargo ship after it ran aground. The country's blue penguins that survived the spill need to have oil cleaned off of them, and the sweaters are an attempt to keep the penguins from licking the oil off of their feathers prior to cleaning, similar to the way a plastic cone around dogs' necks keeps them from scratching their surgical stitches. Oil can be extremely harmful to penguins, whose feathers are very different from other birds. They have very dense and tiny feathers of different lengths that stick onto them like Velcro, creating a waterproof pseudo-wetsuit. This "hole in their wetsuit" causes the penguins to get cold, and it can take time before they're healthy enough to have the oil cleaned off of them. 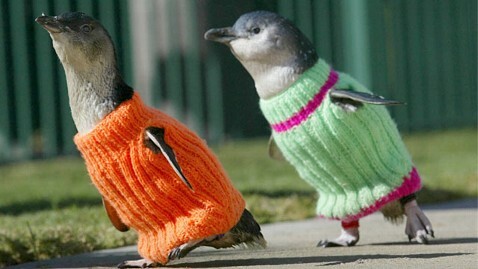 Therefore, they need a stop-gap warming mechanism: tiny, adorable sweaters. The New Zealand yarn shop Skeinz organized the effort, making a penguin sweater pattern available on its website and asking knitters to mail their finished products to them for organization and distribution. The store is now reporting that they have been inundated with sweaters and don't need any more at the moment. But they're keeping the excess supplies on hand in case the Wildlife Rescue Team needs more in the future. Never underestimate the power of a penguin in a sweater to galvanize knitters to action. Thanks to Chris B. for the tip!